(5) Keep (or rename them if you prefer) these 2 files (steps 2 and 4) in a safe place. 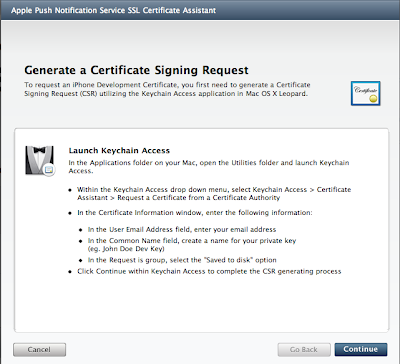 You might need the CertificateSigningRequest.certSigningRequest file to request a new cert for a new app in the future or renew the old cert when expired. (6) Suppose you have imported the aps_developer_identity.cer to the keychain. Then you have to export these new cert and the private key of this cert (not the public key) and saved as .p12 files. (8) The cert.pem and key.pem files will be used by your own php script communicating with APNS. But please set the file permission of this unencrypted key by using chmod 400 and is only readable by root in a sever configuration. Please be patient to get message from the sandbox server. Normally, you need 10 minutes+ to get the first message from push notification testing. Here is the feedback server request php code. For the sandbox feedback server, you have to create a second dummy app to make the first one works. May be the sandbox feedback server is buggy as the production push and feedback servers does not have this problem. Hints: If you want to test the production push and feedback servers, use the adhoc distribution certificate and adhoc build to your devices. Moreover, the device tokens are different for the same device under sandbox and production servers. I get repeated errors when using terminal, and when using browser I get through once every 9 or 10 tries. Moreover, please check your generation of ck.pem, may be the file is not generated correctly. yes I noticed but even with the new one I get the same error. I tried copy pasting from apple doc, doesn't work either. (I have no knowledg of objc I simply use apns to get important messages from my website). any idea what I should do to make it work? it used to be registerForRemoteNotifications so I guess that's why. gives me "warning control reaches end of non-void function"
How to send the payload to the application after submitting to app store. I mean , after testing the application and submitting to app store, how to send the payload from php to all device using the application? My certificate will not export as a p12. What am I doing wrong? Okay, I did the first step. But how do I export the file and its private key in the keychain application? I cannot select .p12 as output file format? Only .pem, .cer and .p7b are available. Any ideas? A very helpful tutorial, appreciate the efforts. This tutorial is for a distribution profile rt? 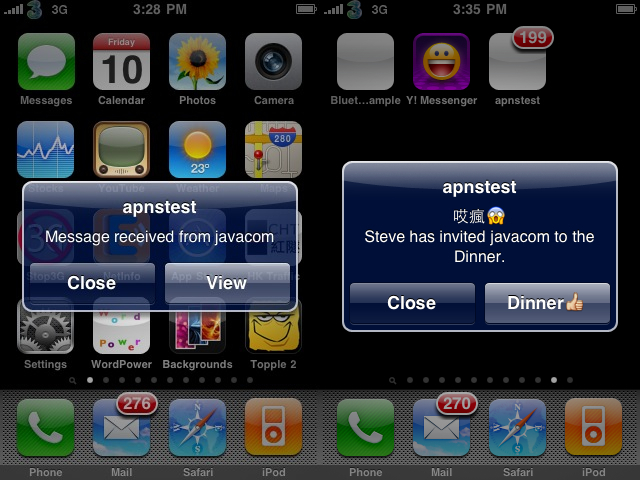 Cant we test the push notification with the developer profile and test it on the simulator or the testing device? If so, can some tell me the detailed step in doing so.. I have generated the APNs certificate and provisioning profile and installed them on the mac n the iphone, i have also save the .p12 on my mac. Can someone guide me from here? Works fine on a non-jailbroken 3GS but fails on a jailbroken 3G. Has anyone managed to make this work on a jailbroken device ? Im my case, "didRegisterForRemoteNotificationsWithDeviceToken" is never called so that I can retrieve the device token. I'd like to know the steep of push notification deployment. How I configure and communicate between my iphone application and the provider ? As per the Apple document, we can get one button as "Ok" but if pressed it just dismisses the alert and will not launch application. you put null string "" in alert, if you want one button only. How do you send emoji through APNS? I would like to know what does this format specifies. I can not retrieve device token. The two delegate method for device token found do not invoked. What do you mean by "second dummy app"? About when does the feedback service send anything? I can send messages now but the feedback service is always empty. I'm successful in sending notifications in the development environment. Now i need to deploy this in the production environment. What are the necessary changes that needs to be done except that i need to change the gateway url to gateway.push.apple.com . Do i need to generate a new ck.pem file with aps_production_identity.cer? and place it on the server? You have to generate and download the production cert from the portal and generate the new ck.pem to the server. where $device_token_length is 64, the length of a device token in nybbles. For the error "Unable to set local cert chain file", uncomment the line "extension=php_curl.dll" in php.ini. Ensure that php_curl.dll is located in php/ext/ folder. Restart apache & php, the problem will be gone. I can send the request for push message successfully from my MAC terminal. I have a valid device token id.But I can't receive any notifications on my device. I make the apns server in first attempt using the code and description. I got this error while executing apns.php. But it is working perfectly in the local server and not in the remote server. Please advice me on this. In apns.php, from where do I get the device token. I am facing error with PHP server code in index.php file. Please assist me where I am lacking. I have generate ck.pem from 2 different mac and aswell deployed via windows server also but having above errors. someone know how the change of december 22 will affect this script? My device did not receive any message. How can i know that my message pushed to the server? I was able to successfully receive push notification. Simple description, easy to follow. Thanks for Gr8 Post !!!!! !